I recently had the opportunity to visit the furniture design studio in New York of PLY PROJECT®, a recent newcomer to the design world. The brain behind the studio is Kenichi Sato, a creative Japanese-born designer and alumnus of the über-architecture firms of Skidmore, Owing & Merrill and Rafael Viñoly Architects. The innovative and unexpectedly comfortable line of indoor FLEX chairs pleasantly surprised me. Following the Japanese and Danish design ethos of balance, proportion, looks, simplicity and practicality, the chair frames are made of birch plywood and the surface is made of either birch or bamboo with a special type of foam sandwiched in-between. The chair surface is then draped onto the frame and fixed to it by a couple of magnets, making the chair quite portable without skimping on its sturdiness. The FLEX Chair Series are flat-packed and shipped by UPS from the Japanese manufacturing plant near Tokyo. The line includes a chaise lounge, high back and low back chairs (image above) and ottoman and range in price from approximately $600 – $2000. This may be an inexpensive line of furniture, but it is certainly not “cheap” in its construction, detail, and comfort. For more info, kindly contact Kenichi at: kenichi@plyproject.com. 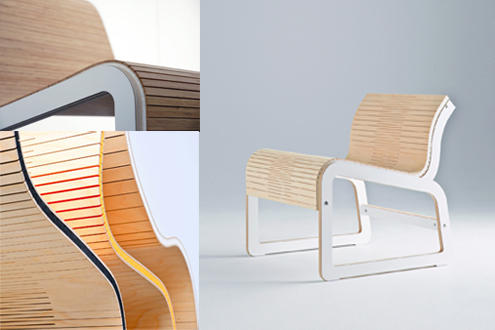 Image credit: © Kenichi Sato for Ply Project. RHS: Low back chair in birch plywood.